Henry George would say Krugman’s heart might be in the right place, but he lacks some essential components, especially the need to distribute wealth from opportunities in land and not “soak the rich” which is a childish game. 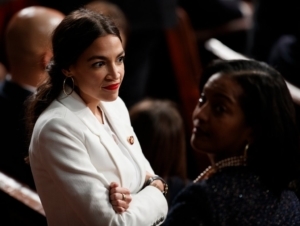 Krugman provides good data to make the point AOC’s ideas were at one time US policy; but until 1972 the opposite of AOC’s ideas seemed to be correct (growth rate zoomed with the lowering of the max tax rate on incomes from 90% to 70%, then rose again with the lowering of the tax rate from 70% to 30% in 1981). But from 1957 to 2017, it seems, lower top tax rates correlate with lower growth. But the 1972-75, 1984-86, and 2005-08 saw an increase in financialization of the economy among other troubling things like trillions chasing commies and now terrorists. Clearly there is no causality in the data Krugman offers. But, yes, many people were as crazy as AOC in the 50s to think high taxes on the wealthy was a good idea. “Good” mainstream economists (e.g., Stiglitz and Friedman) also praise the idea from 140 years ago that only land rent (plenty of rich people there), go to fund government, and concurrently bring rich, middle, and poor income tax rates to 0%. So let’s be careful how we cherry pick our data and explore more than Krugman’s hobby horse ideas. It is VERY important WHICH rich people pay and WHAT they are taxed on. I think most people would welcome a 30% increase in pay, even if it meant (non-land owning) capitalist pigs got the same.